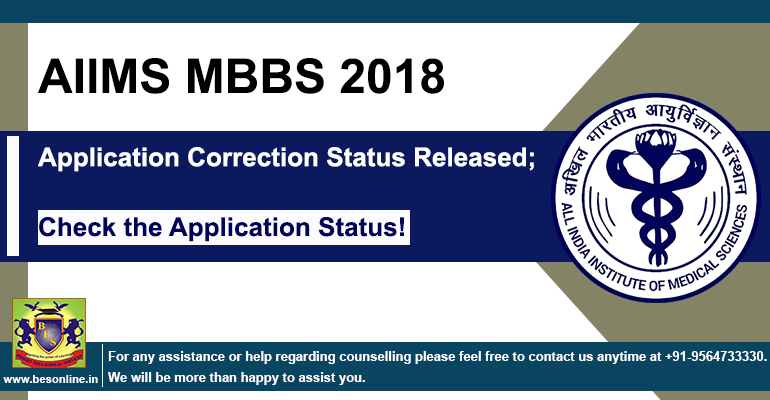 AIIMS MBBS 2018 Application Correction Status Released; Check the Application Status! All India Institute of Medical Science (AIIMS) has released the registration status for AIIMS MBBS 2018 entrance examination. On March 20, as per an official notification. All the candidates were required to avail this opportunity to correct deficiencies in their application form. Candidates can check the application status on the official website (aiimsexams.org). The exam will be conducted on May 26 and 27 for admission into MBBS course at AIIMS New Delhi, Patna, Bhopal, Jodhpur, Bhubaneshwar, Rishikesh, Raipur, Guntur (Andhra Pradesh) and Nagpur (Maharashtra). The online exam will be held on 2 shifts (09:00 am to 12:30 pm & 3 pm to 6:30 pm) on each day.